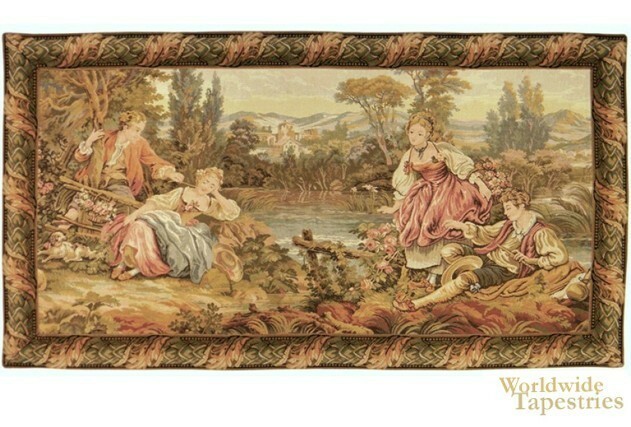 Part of his legendary Noble Pastorale series of six tapestries, “Lakeside rendezvous” shows two couples enjoying a summer’s day by the lake. One of Boucher’s favorite subjects, romance is in the air as the couples court in front of a rich landscape filled with amazing detail. Boucher’s control of color and lighting is readily apparent. King Louis XV’s mistress, Marquise de Pompadour, was said to have been a great fan of his work. He was certainly one of the most popular and most celebrated French artists of the 18th century, not only serving as court painter during Louis’ reign, but as a designer of theater costumes and sets as well as tapestries, such as “Lakeside rendezvous”. This tapestry is lined and has a tunnel for easy hanging. Note: tapestry rod and tassels, where pictured, are purchased separately. Dimensions: W 44" x H 24"
Dimensions: W 68" x H 48"